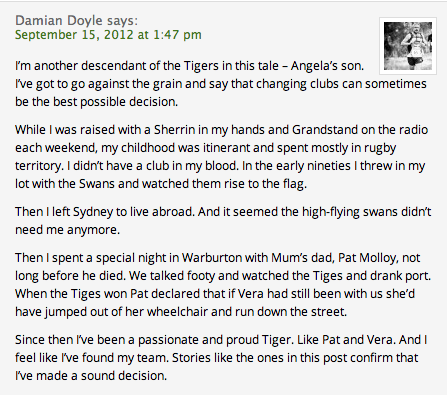 I first posted this in 2011 on Nick Maxwell’s blog, and secondly (with additions) on the footy almanac site. Here is my third posting, with further updates! You’ll just have to remember it was written in the context on football 2011. i’m posting this one last time as i’m off to punt road with my daughter molly to watch Port melbourne v richmond, as my family did back in the early 1900’s. Read on. Whether a mere publicity stunt or pure stubbornness, it just didn’t sit comfortably with me. Firstly- what exactly did Essendon do wrong? I don’t particularly love the way in which they conducted themselves post-season 2010, but I’d love that ruthless nature should Richmond adopt it. I also get the sense that the majority of Essendonians are supportive, given the sudden spike we saw in 2011 membership sales. Secondly- what will Patrick do when Richmond one day acts in a way he can’t respect? Surely it’s only a matter of time. Will he switch clubs again? And thirdly- how can you turn your back on such a family institution and tradition? How can you push down that instinctive ‘urge’ for your team? I haven’t found the off switch yet! Perhaps decades of sports journalism is the answer? I was reminded of these ‘antics’ as I read through the memoirs Fr Kevin Cronin, my first cousin, twice removed, or more simply, my grandmother’s cousin. Kevin passed away in 2007. 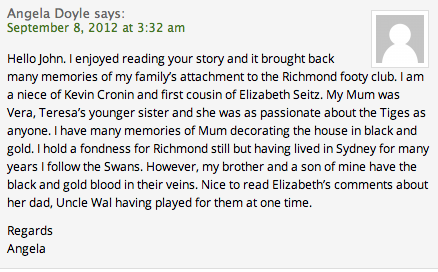 His stories added to what I already knew of my family’s links with Richmond, both football club and suburb, yet from a different perspective. The Cronins were of Irish heritage as was much of Richmond’s population, and have been traced back by family members as far as my great great great grandfather, Patrick Cronin, who emigrated from County Cork in Ireland to Richmond in th1840s, during the period of the great potato famine. The first thing that leapt from the pages as I read Kevin’s memoirs was simply a paragraph on his father, Thomas Cronin, brother of my great grandfather, Maurice. In trying to locate some information about this match in Brian Hansen’s “Tigerland”, the Richmond Football Club history, I came across numerous spiteful clashes between Richmond and Port, and to pinpoint the specific afternoon is difficult. A fierce footballing rivalry was lost when Richmond joined the League in 1908! 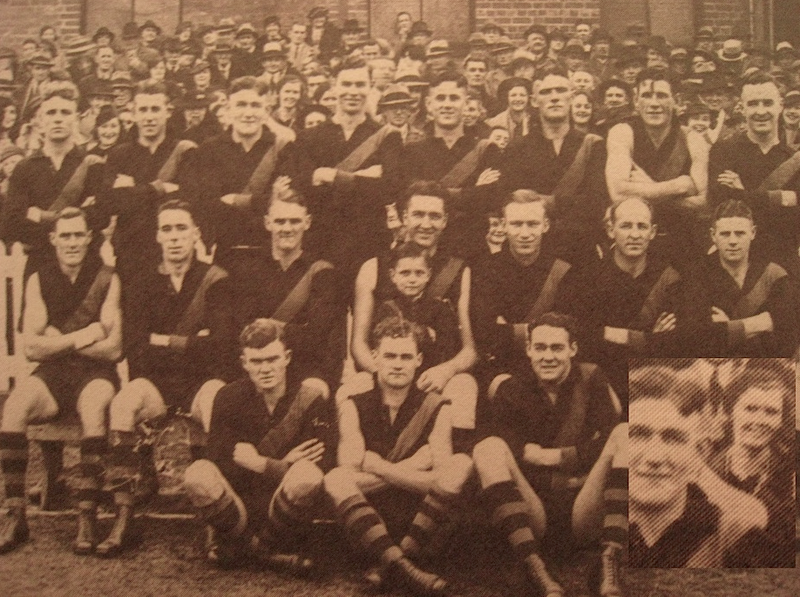 I was fascinated to learn that my family’s link with the Richmond club pre-dates entry into the VFL in 1908. I can only assume that my great grandfather too watched Richmond in the VFA, as my father spoke of how he was a Richmond supporter and member of the cricket club. This all got me thinking, what about my great, great grandfather, Maurice Cronin senior? Surely as he lived in Richmond, and his children followed the club, he too would have been a Tiger, or a Wasp as they were known in the early days! So I asked my own father again if he knew anything of it, and he pointed me in the direction of the Richmond cricket club, remembering that there had been some link, though unsure of its nature . So I scurried off to my library of all things football (with a smattering of cricket) and pulled out my copy of the History of the Richmond Cricket Club. And there he was, Maurice Cronin (snr), on page 122! It turns out that Maurice Cronin hosted the players on their tours of the wineries during their 1921 rural trip in and around Rutherglen. The players “eventually staggered home after visiting the local vineyards and the Viticultural College, where Maurice Cronin, an old Richmond personality held sway as principal”. An old Richmond personality? I like the sound of that! This story certainly rings true with family records, as my own Nana spoke of visiting her grandfather in Rutherglen. There’s also a copy of an electoral role from the time which listed “Cronin, Maurice, Viticultural College, Rutherglen, vineyard manager”. 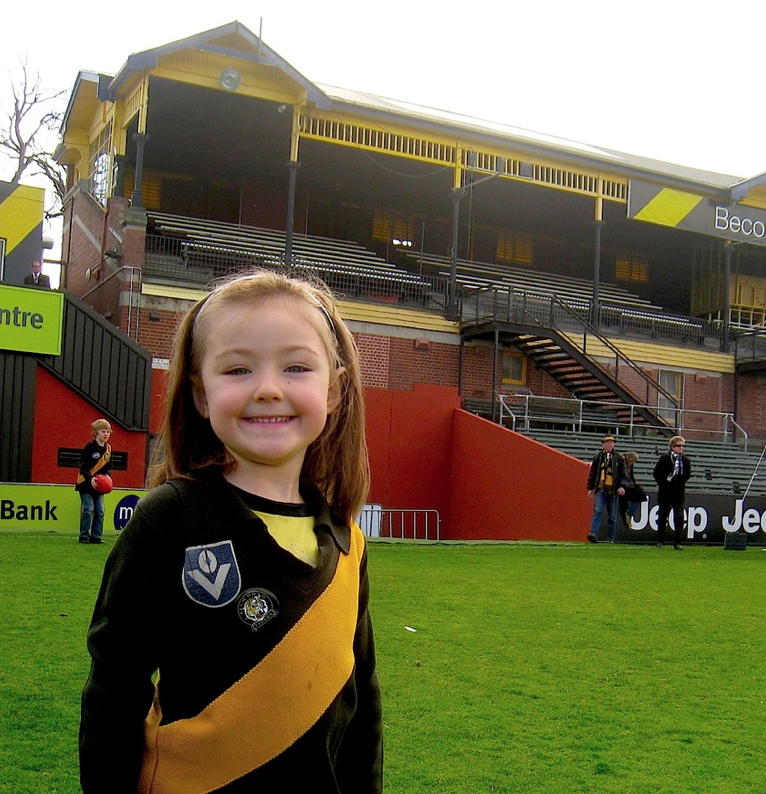 It can only be assumed, and I don’t believe I draw too long a bow, that my family’s support of the Richmond Football club extends six generations, with my daughter now firmly entrenched in the Richmond camp. I’ve also made life as anything other than a Tiger for my 5-month-old son difficult, naming him Richmond Jack… Richie for short! Here’s hoping he doesn’t rebel like Patrick Smith and end this Richmond fanaticism. Ed-August 2015: Adding to this and again thanks to Rhett, it now turns out that Maurice Cronin Snr was vice-president of the football club during the first world war years. An old Richmond personality indeed! 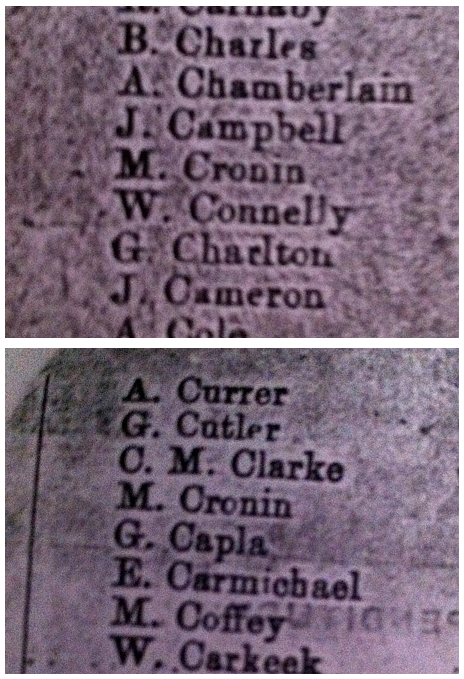 Richmond Football Club’s membership records from 1905 (top) and 1906 (below) show that M.Cronin, my great-great grandfather, was a member of the club. While my great-great-great grandfather, Thomas Cronin lived in Richmond from 1845 until his death there in 1896, I’ve no evidence to suggest he followed the club, which would make my children seventh generation Richmondites. My feelings are that he may have, but as the club was merely 11 years old when he passed, he may have had no time or interest for sporting clubs in later life. Besides, it would be too many bows drawn far too long. But enough speculation, and back to Kevin Cronin’s memoirs. In between stories of serving his priesthood in India and other family tales, he also touched upon his own following of the club, going to watch the Tigers play whenever they played at home, just over the road at the Punt Road Oval in the 1930s and 40s. 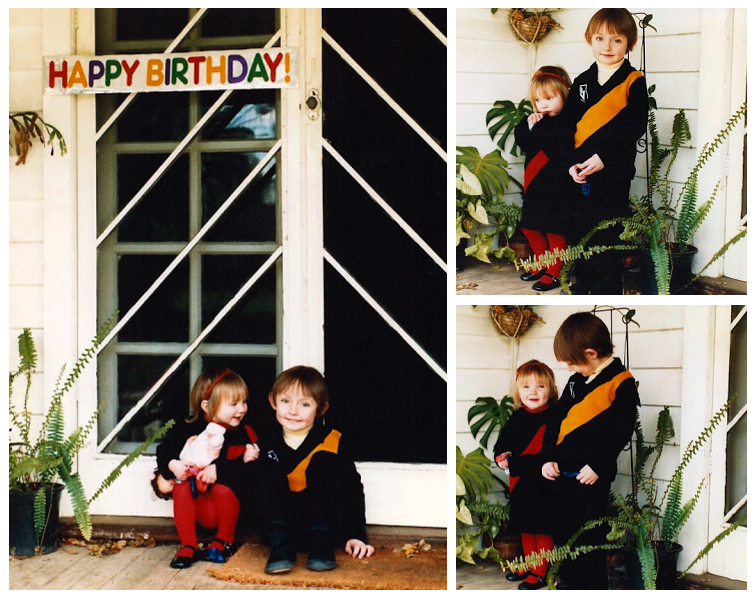 “I used to have a Scholar’s Membership Card” he recalled, and would often attend with his elder sister Teresa, the most passionate Richmond fan of the lot. “We would sit together in the stand while holding a place for a pal of hers who lived at the top of Richmond Terrace… while people near us grumbled about the amount of space we occupied!” Nothing has changed there, although reserved seating has taken such angst out of many a football fans experience! Then Kevin continued with some information which fascinated me no end. While Richmond’s current day song is oft regarded as the league’s best, Kevin spoke of a Richmond song in the 1940s, of which I’d never heard. According to Rhett Bartlett it would have been one of many ditties used by Richmond fans, not an official club song. That would come later. Go ahead- hum it to yourself. It’s quite catchy! The names mentioned are for me almost fictional characters, having only read about them in books, representing a time and place in football and life that is long past. I can only bring them to life using a combination of faded black and whites and a vivid imagination. A visit to my nana and pa’s “little bit of Richmond” in Forest Hill was never complete without three things. Licorice all-sorts, watching old football videos and a fossick through the old Richmond scrapbooks my nana kept from 1958 through to 1969. Top cupboard, spare bedroom. Newspaper clippings yellowing with age, these scrapbooks had a unique aroma, a magical mustiness which permeated my senses. Each match has the selected teams from the Friday paper, results and any match reports or pictures, plus a ladder at the completion of each round. There were pre-season pictures of players training in sand shoes and the odd shot of a new recruit at his work-place. The hours I’ve spent poring over these family treasures is immeasurable, yet I seem to come across something new upon each viewing. Once the Tigers finally broke the premiership drought of 24 years (current drought is 31 years strong) the scrapbooks began to wain slightly, until coming to an end in 1969, another premiership year. It appears that my nana was well satisfied with victory and lost the hunger! Though my grandparents are no longer with us, the scrapbooks are still in the family. Now my grandparents were born and bred Richmondites; married at St. Ignatius atop Richmond Hill, Labour and then DLP voters and of course Tigers at heart. Remembering that Richmond was once referred to as “Struggletown”, it’s no wonder that they, like many others, eventually headed for the space and comfort offered by Melbourne’s east and south eastern suburbs. Firstly Carnegie, finally Forrest Hill. My pa was old school. “Kick-it, KICK the dam thing….ahhhh!” He also had it in for Brendan Gale for reasons never explained, as if every Richmond loss was solely his doing! Whilst never admitting it, I think he disapproved of Benny’s curly locks! 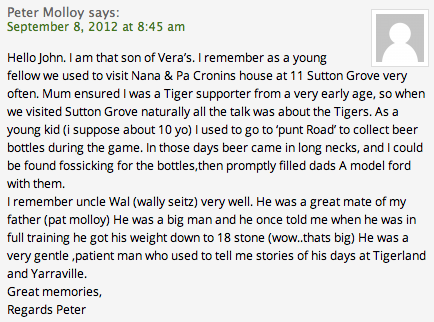 Yet a Tiger victory would see Pa humming away to himself, quietly satisfied as he poured himself a sherry. My nana spent much of her childhood and married life living in Docker street, Richmond, a street which also housed Tiger and Australian Football great Jack Dyer. Younger than Jack, she frequented his milk bar on Church St. “He knew me by my first name” she often told us. It must have been quite a place to hang out. Can you imagine if Buddy Franklin ran a milk bar down on Glenferrie road? Nana’s cousin Kevin also frequented Jack’s shop. After junior football on a Sunday he and his mates “used to congregate for shakes or spiders at Jack Dyers milk-bar on Church street. Jack was always an interested and courteous host.” It was simple. You live in Richmond, you barrack for Richmond. It’s unimaginable these days. So to Patrick I say, football clubs are, to a lot of us like family. Or like mine, the two are so intertwined that you’re not sure what came first. I may not agree with or condone everything my family does, but I still accept and love them for who they are. The same goes for my footy club. The following are comments from distant family members who added a great deal of information to the story. Included is a family member who played for the club!! This is a bit self-indulgent but it may interest a few of you! Below is a grab from the book Pioneers. 1986, my 5th birthday. sister maryanne was still being ‘Essendon-ed’ by my mum, but this was futile. She was a Tiger soon enough. The year was 1986. I’d just been to my very first league match. It was a Richmond v North Melbourne Friday night match under lights at the MCG. Richmond had beaten the Roos. I have some vague memories of meeting dad at work in the city with mum, catching the tram to the ground and sitting in the old southern stand. I remember the sheer size of the MCG, the excitement of the lights as we approached the ground. I remember being cold. I remember being glued to the match. The above photo was taken three weeks later as I celebrated my 5th birthday. Little did I know I’d just begun a complicated journey with my dad’s team, Richmond, who just six years earlier had held aloft the premiership cup. I saw Maurice Rioli play that night, so the record books tell me. Little did I know the emotional pain following Richmond would bring to my life. The embarrassment at school, the anger at matches, the hollow feeling of being overrun in a final quarter, time and time again. Losing the unlosable and failing whenever it really matters. But I wouldn’t change a thing. Following Richmond has been difficult, a real test of character. Yet I’m thankful to barrack for the club and suburb that my family both followed and lived in. I’m thankful for hearing the story my dad told me tonight, that his dad, my pa, would come home from games in the late 1950’s and early 1960’s saying “Well it wasn’t Ron Branton’s fault we lost!” I could say the same of Daniel Jackson today. Some of the best memories growing up were of rare Tiger wins, ringing nana and pa and asking them to record the replay. I’d watch it the following Friday night when we’d go over for dinner. Stick with them Tiger fans. Just think what some Fitzroy fans would give to still be able to go and watch their team each week, whatever the result. 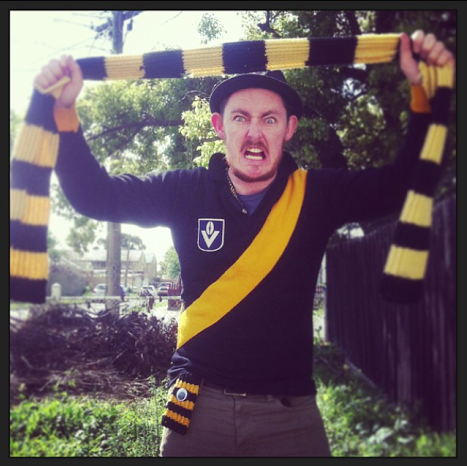 As I left the ground on Saturday with Richie and Mol (the eldest isn’t into footy), the three of us clad in knitted Richmond jumpers, a punter tapped me on the shoulder and with a glint in his eye and suggested it was child abuse that I put my kids through following Richmond. Yes, I’ve heard that one before. I didn’t bother telling him that one of them had ‘Richmond’ on their birth certificate! I did however reveal my birth year…1981. He chuckled and wished me the best, much like a drunk uncle would on Christmas day. Left:On our way to the footy. ‘Richmond’ is wearing the same jumper I’m wearing in the first pic. Thick and thin. What’s another 30 year wait? I love the Richmond Football Club. My one year old son Richie joined our family footy tipping competition this year. My dad has been running it for 22 years, people have come and gone, but I can officially say that Richie is our youngest ever tipster. And what a start he made, tipping 8 out of 9 in round one of this season…beginners luck or does he just have the knack? So here is how little Rich tips. Some use their heads, some their hearts. Rich uses his…..I don’t really know? Just watch!